Mike Smet attained his degree as M.D. in 1992 at the University of Antwerp, Belgium. He graduated in internal medicine in 1997, and afterwards also graduated in Emergency Medicine in 1999 and Intensive Care Medicine in 2001. He has been working in ZNA Middelheim general hospital in Antwerp since 1999, where he works both in the emergency department and in the intensive care department. He has a special interest in good clinical practice and rapid evaluation of the critically ill patient. During his internal medicine training he became interested in the use of ultrasound to support his clinical work. Soon after starting work in the emergency department he initiated the use of using ultrasound as a major tool to support daily practice in a very busy department. 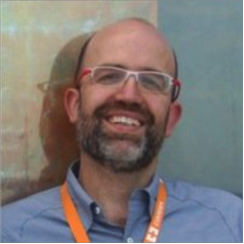 He followed the WINFOCUS course in Rome in 2010, and became very interested in the use of lung ultrasound and the use of ultrasound in critically ill patients. He gave a well appreciated lecture on the use of lung ultrasound in the emergency and intensive care department at the Bronkhorst Colloquium for Dutch and Flemisch chest physicians in 2011 and 2012. He lives in Boechout with his partner and two children. In his spare time he likes to cook and visit jazz and rock concerts.